Baskets, Pack Baskets custom made by local Artists within The Adirondack 6 million acre park in upstate New York: Lake Placid, Saranac Lake, Glens Falls, Old Forge, Lake George etc. We invite you to browse our exciting selection of Baskets, made by local artisans. Enjoy Your Visit! Adirondack Basket Case creates Custom Baskets for any occasion. 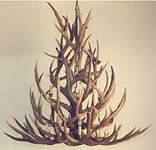 Pack Baskets, Baskets for Hikers, Gift Baskets, Wedding Baskets, Birthdays and Baskets for any Holiday! All of our baskets are hand crafted, assembled and decorated here in the Adirondacks especially for you. Choose from our specially designed baskets or build your own! Secure Orderform Online!! We offer Direct Shipping! Checks, VISA, Mastercard or Discover Accepted. A Great Gift Giving Idea! 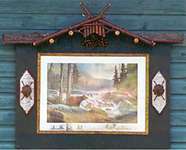 We invite you to visit our Adirondack Gallery showcasing unique Adirondack Furniture ~ Antler Chandeliers & Lamps ~ Hand Painted Canoe Paddles ~ Adirondack Packbaskets ~ Adirondack Prints ~ Authentic Birch Bark Framing ~ and hand crafted gifts for the holidays. Click here!